If Londoners were to jump in the eco-friendly shower, it would reduce the capital’s water usage by 85 billion litres each year – the equivalent of 85,000 Olympic-sized swimming pools. The shower works on similar principles to a Dyson vacuum cleaner, using filters and hydro cyclones, installed behind the shower unit, to clean the recycled water and reheat it to the desired temperature. 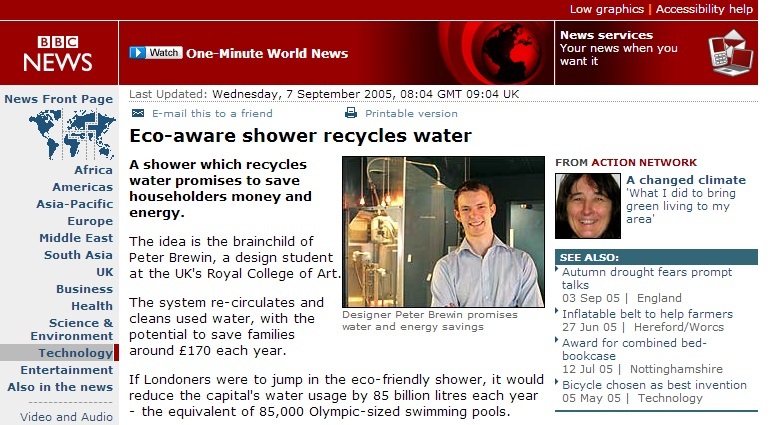 The shower has just won the British Standards Institution 2005 Environmental Design Award. Judges saw the design as particularly pertinent given the water shortages that have been predicted for London and many other parts of the UK. “Peter has used innovative design to provide a solution to an immediate environmental problem combined with significant cost savings for consumers,” said Awards judge Nick Marshall. From Mr Brewin’s point of view the aim of the project was to balance both the needs of the consumer and the environment and to make sure it had a chance to make it into the shops. “Designing something which is good for the environment but which has no commercial value did not make sense, because it will never get to market,” he said. The shower has some nifty functions, including a pause button designed to please anyone who has unwittingly stepped into a freezing cold shower. The button allows water flow to be stopped until it hits the right temperature. Other features include a water meter showing water usage per shower and a chlorine filter.